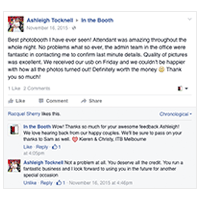 We love hearing from our past clients and guests. 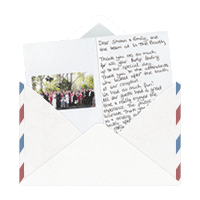 Here is a selection of un-edited feedback received via post, email and social media. 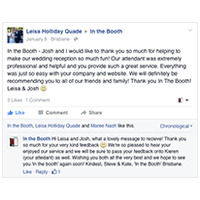 Hi Chris and Carly, we would both like to thank you so much for the brilliant service you provided us from start to finish with the booth. Albert was such a fantastic attendant and people commented all night on how much fun they had! The highlights bring back so many funny memories for us – just wish we could do it all over again! We already had a friend at the wedding ask about your booths 🙂 Again, thank you so much. All the best, Sam and Mat Watkins. Best photobooth I have ever seen! Attendant was amazing throughout the whole night. No problems what so ever, the admin team in the office were fantastic in contacting me to confirm last minute details. Quality of pictures was excellent. We received our USB on Friday and we couldn’t be happier with how all the photos turned out! Definitely worth the money. Thank you so much! Ashleigh Tocknell. 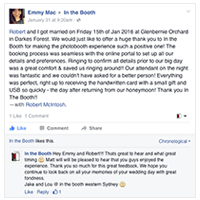 Robert and I got married on Friday 15th of Jan 2016 at Glenbernie Orchard in Darkes Forest. 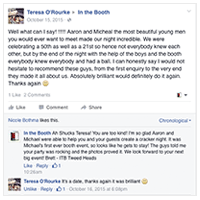 We would just like to offer a huge thank you to In the Booth for making the photobooth experience such a positive one! 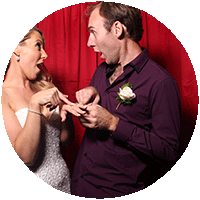 The booking process was seamless with the online portal to set up all our details and preferences. Ringing to confirm all details prior to our big day was a great comfort and saved us ringing around!! Our attendant on the night was fantastic and we couldn’t have asked for a better person! 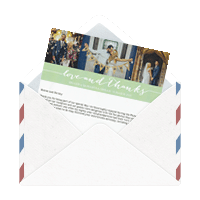 Everything was perfect, right up to receiving the handwritten card with a small gift and USB so quickly – the day after returning from our honeymoon! Thank you In the Booth!! Emmy Mac. Well what can I say!!!!!! Aaron and Michael, the most beautiful young men you would ever want to meet, made our night incredible. We were celebrating a 50th as well as a 21st so hence not everybody knew each other, but by the end of the night with the help of the boys and the booth everybody knew everybody and had a ball. I can honestly say I would not hesitate to recommend these guys, from the first enquiry to the very end they made it all about us. Absolutely brilliant would definitely do it again. Thanks again. Theresa O’Rourke. 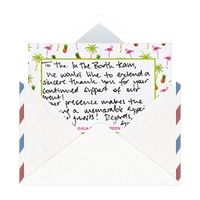 To the In the Booth team, we would like to extend a sincere thank you for your continued support of our event! Your presence makes the evening a memorable experience for all guests! Regards, Gala on the Green Committee. 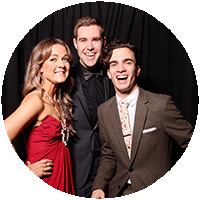 In the Booth – Josh and I would like to thank you so much for helping to make our wedding reception so much fun! 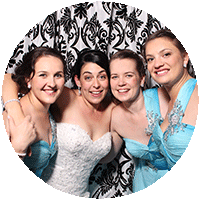 Our attendant was extremely professional and helpful and you provide such a great service. Everything was just so easy with your company and website. 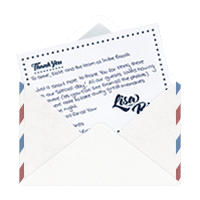 We will definitely be recommending you to all of our friends and family! 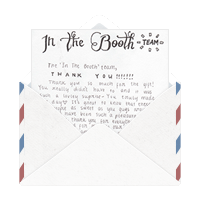 Thank you In the Booth! Leisa & Josh.